"An attractive early Belleek pottery Second Black mark Irish Shamrock pattern tea cup and saucer in wonderful condition. 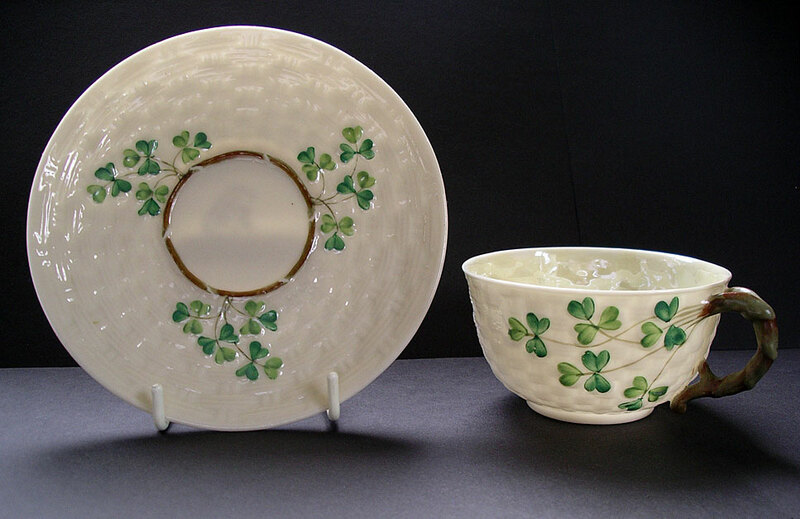 Shamrock is one of the most iconic and popular of all the Belleek designs and one of the 'must haves' for any collection of best Belleek and fine porcelains. A particularly attractive feature of this set is the fresh looking pearl-white colouring." Antiques Expert Hamilton Bear. Dimensions: width saucer 138 mm max. height cup 50 mm max. Marks: Second Black mark dating 1891-1926 to both pieces as illustrated. Condition: Excellent condition with no restoration and no significant defects. There is one tiny spot of kiln grit from firing on the cup. There is a band of decorative cob lustre glaze to the inside of the cup which does not fully extend into the bottom of the cup as illustrated. This was how the piece was made. Overall a very good set.